Amaravati, Feb. 10 (IANS): Protests were held across Andhra Pradesh on Sunday to mark Prime Minister Narendra Modi’s visit to the state. Wearing black dresses and carrying black flags, protestors took to the streets since early Sunday. Raising slogans of ‘Modi go back’, the activists of various political parties, student groups and mass organisations staged sit-ins or took out rallies. 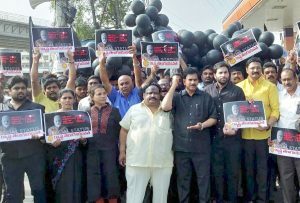 Actor Sivaji and his supporters held innovative protest in Vijayawada by remaining in two to three feet water during Modi’s three-hour visit to the state. 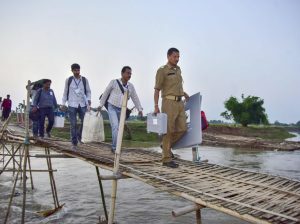 This is Modi’s first visit to Andhra Pradesh after the TDP pulled out of the BJP-led NDA last year.